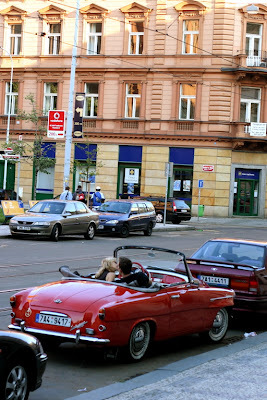 This red convertible is Skoda Felicia - classic Czech car from the sixties. It's quite valuable and quite popular and definitely one of the most beautiful Czech post-war car. And you can have a ride in this car while you're in Prague. Not exactly this one but there is a service for tourists: sightseeing rides through historical center of Prague in historical vehicles - one of them being this Skoda Felicia (I think they have red and yellow). You may know the "new" Skoda Felicia. It was build after Volkswagen bought Skoda in the beginning of the nineties - very practical and with cheap parts. Our family have one (in romantic red color :). Now Felicia has its follower in Skoda Fabia - which you should know in case you're from Europe. Speaking of Skoda, they have like 50% increase in net profit over last year and are producing far more cars every year. Automotive is a big part of Czech industry.